You may have noticed that a ‘To Let’ sign has now appeared outside Bradshaw House. This is to initiate a tendering process similar the one the museum participated in when we sought to purchase the building. This process is ensure transparency by enabling any Community Organisation to express their interest. 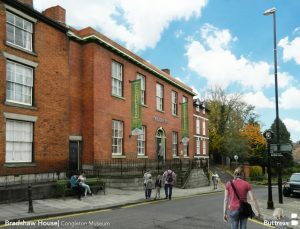 Congleton museum has been described by many of its visitors as a ‘gem’, yet the same visitors have also commented that because of its location away from the High Street, and behind the town hall, it is difficult for the impromptu visitor to find. Since opening in 2002 the museum’s collections have grown, research has identified new and fascinating stories about the town and its inhabitants, but there is insufficient space to display them. Space is also a limiting factor in the type of activities the museum is able to offer as its meeting room can only accommodate 30 people. 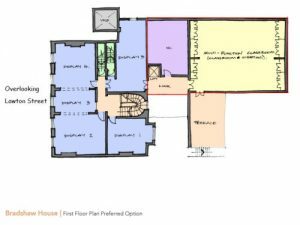 Bradshaw House – how it could look! 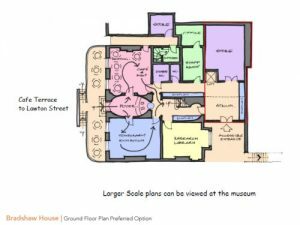 It is to address these issues, as well as preserving and ensuring public access to one of the town’s historic buildings, that the museum is proposing to move to Bradshaw House, in Lawton Street. make provision for with a café with additional seating on the front terrace. A larger version of these plans can be viewed at the museum. This is an exciting opportunity which will bring in excess of £2million worth of investment into the Lawton Street area of the town. The museum trust needs to demonstrate to one of its major potential funding bodies, the Heritage Lottery Fund, that there is overwhelming local public support for their proposal.